Not many people would choose October as their favourite month of the year, with the evenings getting longer, the weather growing colder and Christmas still two months off. But try telling that to Bayern Munich fans, who have been having a whale of a time since Jupp Heynckes returned to the helm. The 72-year-old tactician was coaxed out of retirement on 6 October, four years after winning the treble with Bayern, and assigned the task of re-energising the record Bundesliga champions after an embarrassing defeat to Paris Saint-Germain in the UEFA Champions League ultimately cost Carlo Ancelotti his job. At the time Bayern were second in the Bundesliga table, having thrown away two-goal leads twice in succession to be held to 2-2 draws by Wolfsburg and Hertha Berlin. The Bavarians were five points adrift of league leaders Borussia Dortmund and there was a murky air of discontent at the club's Säbener Strasse base in central Munich. Fast-forward to the end of October, however, and the situation is very different. Bayern's 2-0 win at home to RB Leipzig on Matchday 10 was a fifth victory in as many games for Heynckes and has taken them to the league summit for the first time in 2017/18, now three points clear of Dortmund. That run also includes a Champions League win over Celtic and a penalty shoot-out triumph over Leipzig in the DFB Cup second round. So how has he done it? Heynckes' first move was to revert to his tried-and-trusted 4-2-3-1 formation that brought so much success in 2013, switching from the 4-3-3 under Ancelotti. Bayern had let in seven goals in their first seven league games this season, but they have not conceded any in the Bundesliga since then. Indeed, the only time they have failed to keep a clean sheet under Heynckes was during the cup win in Leipzig, going through 5-4 on penalties having been locked at 1-1 after extra time. 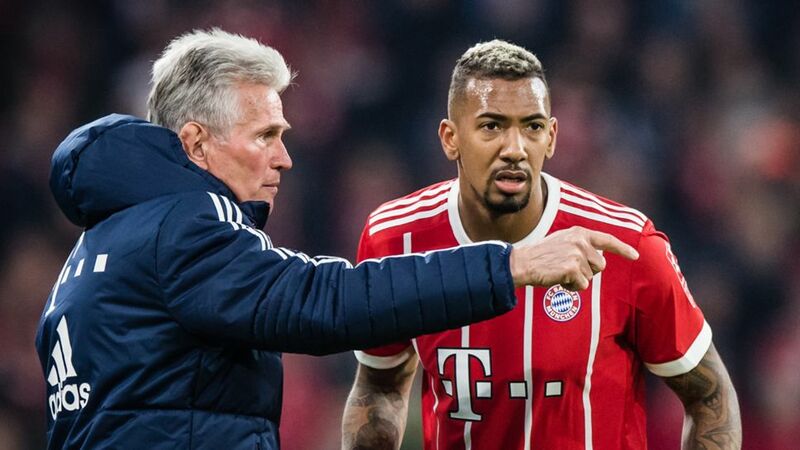 The two holding midfielders have brought greater stability to the Bayern side, and it is telling that one of Heynckes' first decisions was to push Javi Martinez further up the pitch, doing so in his first match in charge at home to Freiburg on Matchday 8. Martinez arrived in Munich at Heynckes' request in 2012 and was a crucial member of the treble-winning ensemble. He was subsequently used as a centre-back under Pep Guardiola and Ancelotti, but also looks at ease higher up the pitch and even teed up Robert Lewandowski to score against Leipzig with an exquisite through-ball on Matchday 10. The influential old guard are also clearly happier now, too. Earlier this season, Arjen Robben and Thomas Müller were not playing as much as they were used to, with the latter even commenting: "Obviously my qualities are not entirely appreciated. I don't know what the coach [Ancelotti] expects of me." Under Heynckes that has changed, and both now tend to start when fit. Six games, 14 goals scored, two conceded and still going strong in three competitions. If that is what Heynckes has achieved in a month, then Bayern could be sitting very pretty by the time the trophies are handed out in May. Quiz: How much do you remember about Bayern's 2013 Champions League triumph?